18 99 !— S/2003 J 12 0001 !1 1215 !0.000 15 17,739,539 −482.69 142.680° 0.4449 2003 谢柏德等人 阿南刻? 19 Valetudo† 1 2016 谢柏德等人 ? 24 52 !木衛五十二 S/2010 J 2 0001 !1 ? !? 20,307,150 -588.1 150.4° 0.307 2010 Veillet 阿南刻? 37 30 !木衛三十 Hermippe 0004 !4 139 !0.009 0 21,182,086 −629.81 151.242° 0.2290 2002 谢柏德等人 阿南刻? 48 58 !木衛五十八 S/2003 J 15 0002 !2 1315 !0.001 5 22,720,999 −699.68 141.812° 0.0932 2003 谢柏德等人 阿南刻? 49 99 !— S/2003 J 10 0002 !2 1315 !0.001 5 22,730,813 −700.13 163.813° 0.3438 2003 谢柏德等人 加爾尼? 53 44 !木衛四十四 Kallichore 0002 !2 1315 !0.001 5 23,111,823 −717.81 164.605° 0.2041 2003 谢柏德等人 加爾尼? 59 32 !木衛三十二 Eurydome 0003 !3 1345 !0.004 5 23,230,858 −723.36 149.324° 0.3769 2002 谢柏德等人 帕西法爾? 62 51 !木衛五十一 S/2010 J 1 0002 !2 23,314,335 −722.83 163.2° 0.320 2010 Jacobson et al. 帕西法爾? 65 56 !木衛五十六 S/2011 J 2 0001 !1 1315 !? 23,400,981 −731.32 148.77° 0.3321 2011 谢柏德等人 ? ^ Solar System Bodies. JPL/NASA. [2008-09-09]. ^ IAUC 7555, January 2001. FAQ: Why don't you have Jovian satellite S/2000 J11 in your system?. JPL Solar System Dynamics. [2011-02-13]. ^ 5.0 5.1 Chown, Marcus. Cannibalistic Jupiter ate its early moons. New Scientist. 2009-03-07 [2009-03-18]. ^ Xi, Zezong Z. The Discovery of Jupiter's Satellite Made by Gan De 2000 years Before Galileo. Acta Astrophysica Sinica. 1981, 1 (2): 87. ^ Galilei, Galileo. Translated and prefaced by Albert Van Helden, 编. Sidereus Nuncius. Chicago & London: University of Chicago Press. 1989: 14–16. ISBN 0226279030. ^ Van Helden, Albert. The Telescope in the Seventeenth Century. Isis (The University of Chicago Press on behalf of The History of Science Society). March 1974, 65 (1): 38–58. doi:10.1086/351216. ^ Marsden, Brian G. Probable New Satellite of Jupiter. International Astronomical Union Circulars (Cambridge, US: Smithsonian Astrophysical Observatory). October 3, 1975, 2845 [2008-09-03]. （原始内容 (discovery telegram sent to the IAU)存档于2002-09-16）. ^ Synnott, S.P. 1979J2: The Discovery of a Previously Unknown Jovian Satellite. Science. 1980, 210 (4471): 786–788. PMID 17739548. doi:10.1126/science.210.4471.786. 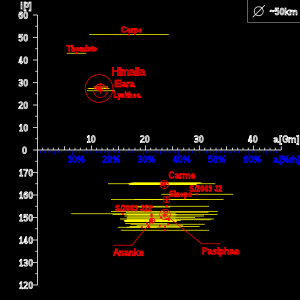 ^ 12.0 12.1 12.2 12.3 Gazetteer of Planetary Nomenclature. Working Group for Planetary System Nomenclature (WGPSN). U.S. Geological Survey. 2008-11-07 [2008-08-02]. ^ 14.0 14.1 14.2 14.3 14.4 Sheppard, Scott S. Jupiter's Known Satellites. Departament of Terrestrial Magnetism at Carniege Institution for science. [2008-08-28]. （原始内容存档于2008-12-06）. ^ 15.0 15.1 Marazzini, C. The names of the satellites of Jupiter: from Galileo to Simon Marius. Lettere Italiane. 2005, 57 (3): 391–407. ISSN 0024-1334 （意大利语）. ^ Nicholson, Seth Barnes. The Satellites of Jupiter. Publications of the Astronomical Society of the Pacific. April 1939, 51 (300): 85–94. doi:10.1086/125010. ^ 19.0 19.1 Satellites of Jupiter, Saturn and Uranus. Working Group on Planetary System Nomenclature (International Astronomical Union). [2008-08-28]. （原始内容存档于2006-02-14）. ^ Burns, J.A. ; Simonelli, D. P.; Showalter, M.R. et.al. Jupiter’s Ring-Moon System. (编) Bagenal, F.; Dowling, T.E. ; McKinnon, W.B. Jupiter: The Planet, Satellites and Magnetosphere. Cambridge University Press. 2004. ^ Sheppard, Scott S.; Jewitt, David C.; Porco, Carolyn. Jupiter's outer satellites and Trojans. (编) Fran Bagenal, Timothy E. Dowling, William B. McKinnon. Jupiter. The planet, satellites and magnetosphere (PDF) 1. Cambridge, UK: Cambridge University Press. 2004: 263–280. ISBN 0-521-81808-7. （原始内容 (pdf)存档于2011-07-14）. ^ Nesvorný, David; Beaugé, Cristian; Dones, Luke. Collisional Origin of Families of Irregular Satellites (PDF). The Astronomical Journal. 2004, 127: 1768–1783. doi:10.1086/382099. ^ 28.0 28.1 28.2 28.3 28.4 28.5 28.6 28.7 Siedelmann P.K. ; Abalakin V.K. ; Bursa, M.; Davies, M.E. ; de Bergh, C.; Lieske, J.H. ; Obrest, J.; Simon, J.L. ; Standish, E.M.; Stooke, P. ; Thomas, P.C. The Planets and Satellites 2000. IAU/IAG Working Group on Cartographic Coordinates and Rotational Elements of the Planets and Satellites. 2000 [2008-08-31].